There’s something mesmerising about sitting in a dark cosy room and staring into the flames. Maybe it’s a primal instinct left over from our ancestors. For them, the fire was both life and death. Get too close and you will burn. Stay too far and you might get snatched by a predator, or consumed by the night chill. Add too many logs and your supply will run out before morning, leaving you vulnerable to predators. Rekindle the fire too sparsely and you get the same result. Plus, staring into the dancing red glow was probably a great way to distract themselves from the scary noises and ominous lights around them. Lights that signalled the eyes of hungry hunters just waiting to pounce. So maybe there’s a part deep down inside us that still responds to fire. We can space out while watching a camp cookout, a beach bonfire, or crinkling logs as they tease the chimney. Euro fireplaces take this fascination a step further with their Milano line of wood-fired heaters. These stylish, free-standing furnaces are beautiful to look at, with their regal height and flaming red sides. They have a slim, elegant frame that seems to stretch into the sky, or at least towards the roof, and their piping system ensures there’s no smoke to ruin your pleasant experience beside the flames. The flames in Milano furnaces are securely ensconced behind a clear glass panel, which makes the experience of watching the flames even more hypnotising. The glass doubles as a safety measure by preventing the potential damage of open flames. 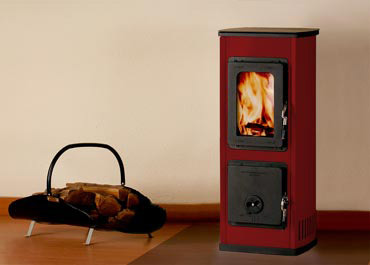 Milano wood heater serves a triple function. The fire warms you up, the lilting flames keep you entertained, and the furnace can be used to rustle up a good meal. This is because the Milano wood heater comes with a cooktop suitable for any kind of meal preparation. Milano offers several benefits over other furnace models. It has low emissions of both smoke and harmful gases, so it’s not only environmentally friendly, it’s also safe for use indoors. It also saves room because if you have a small cabin or a studio living space, you can use it as both a cooker and a heater. It heats rooms efficiently thanks to its air control mechanism and its effective convection systems. These work together to keep the flame burning more completely, and even after the fire dies down, the room stays warmer for longer. It comes with a 2-year manufacturer’s warranty, so you know you’re getting a good quality fireplace. Here at Euro Fireplaces, we’ll match that and add two more years, giving you a total 4-year guarantee. To qualify for this additional protection, make sure your Milano fireplace is installed by a qualified plumber. We will also guide you on the proper use of your new fireplace, to avoid inadvertent product damage. If you’d like to take an even closer look at our Milano pieces or any other furnace in our stock, come by our showroom or give us a call on 1300 733 705. We’ll be happy to get your flames burning.